Through the creation of post-colonial citizenship, India adopted a hybridisation of specific secular and western conception of citizenship. In this democratic framework, Indian Muslims are observed on how they make use of the spaces and channels to accommodate their Islamic identity within a secular one. This book analyses how the socio-political context shapes citizens’ perceptions of multiple variables, such as their sense of political efficacy, agency, conception of citizenship rights and belief in democracy. Based on extensive surveys and interviews and through presenting and investigating the various meanings of jihād, the author explores the usage of non-Eurocentric conceptual approaches to the study of postcolonial and Muslim societies, in particular the meaning it carries in the psyche of the Muslim community. She argues that through means of argumentative and spiritual jihād, Indian Muslims fight their battle towards a realisation of citizenship ideals despite the unfavourable conditions of intra and inter community conflicts. 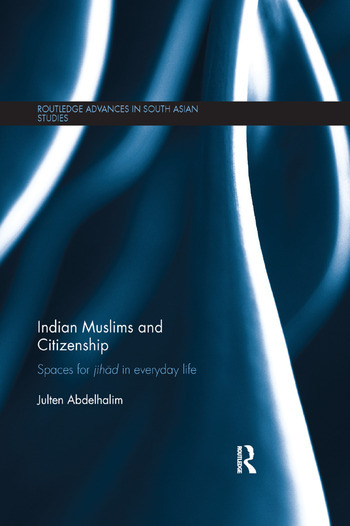 Presenting new examinations of Islamic identity and citizenship in contemporary India, this book will be a useful contribution to the study of South Asian Studies, Religion, Islam, and Race and Ethnicity. Julten Abdelhalim obtained her PhD from Heidelberg University, Germany, and is an Assistant Professor in Political Science at Cairo University, Egypt. She is also a post-doctoral fellow at Humboldt University in Berlin, Germany.